Search || Home » McManaman » What's in a Name? I recall a resolution I made as a young man to carefully consider and learn from the mistakes others made in their lives, especially the mistakes that led to the breakup of their marriages. And of course, that is why history is so important, for it always tends to repeat itself only because, for some reason, many are not interested in learning from the mistakes of the past. The New Testament contains a mistake that is there for all of us to learn from, so as never to repeat it. I refer to Paul's speech at the Areopagus (Acts 17, 22-34). As Archbishop Sheen remarked, it was a perfect speech from the point of view of rhetoric and pedagogy. Paul spoke on the same wavelength as his listeners; he spoke a philosophical language, limiting himself to universal concepts that can be grasped by the natural light of human reason. But his talk was a failure. He made only two converts that we know of: Dionysius and a woman named Damaris. As Sheen points out, he never went back to Athens, and he never wrote a letter to the Athenians, for there is no record that he ever established a Church there. Why did he fail? Because he failed to mention the name of Christ and his crucifixion. He spoke of the "unknown God", made a link between what they unknowingly worship and what he comes to proclaim, God as creator, universal brotherhood, etc., but he never mentioned the crucified Lord. It was a mistake he'd resolved never to repeat: "For Christ did not send me to baptize but to preach the gospel, and not with the wisdom of human eloquence, so that the cross of Christ might not be emptied of its meaning. The message of the cross is foolishness to those who are perishing, but to us who are being saved it is the power of God... we proclaim Christ crucified, a stumbling block to Jews and foolishness to Gentiles, but to those who are called, Jews and Greeks alike, Christ the power of God and the wisdom of God" (1 Co 1, 17-18, 25). Recently I found myself browsing through an issue of a Catholic newspaper for teachers. The issue was replete with good intentions, but the terrible irony is that the name of Christ wasn't mentioned even once throughout the entire issue. Instead, a very subtle Pelagian undercurrent ran throughout. Pelagius, a fifth century monk, denied the doctrine of Original Sin and taught that man, on his own, has the moral ability to rise above the allure of sin. Hence, he has no need of divine grace, and Jesus becomes at best an inspiring role model. The Pelagianism in this particular newspaper rests on the explicitly articulated principle that if people are made to know about certain evils in society, they will care, and if they care, they will act. "Isn't that interesting," I said to a group of students near by, "the name of Christ isn't even mentioned once throughout this entire Catholic newspaper." So one of them asked: "Why do you have to mention Christ? Why can't we just talk about his ideas or his teachings without referring to his name?" After attempting some explanation, he pursued further: "We don't need to mention Plato in order to explain his ideas, nor Aristotle, in order to explain his. In the same way, we don't need to mention Christ, only what he taught." That is the very reason why a Catholic cannot accept the Platonic notion that "if we know (education), we will care, if we care, we will act." Such a notion directly contravenes St. Paul: "For I do not do the good I want, but I do the evil I do not want. Now if I do what I do not want, it is no longer I who do it, but sin that dwells in me" (Rm 7, 19). The good news is that we have been redeemed from the power of sin and death through the name of Christ, that is, the Person of Christ; for it is the name of Christ -- and him crucified -- that is the very power of God (1 Co 1: 18). It is in his name that we are sent out into the world, and it is in his name that we speak, act, and pray: "And whatever you do, in word or in deed, do everything in the name of the Lord Jesus" (Col 3, 17). And it is by virtue of his name that we suffer: "If you are insulted for the name of Christ, blessed are you, for the Spirit of glory and of God rests upon you" (1 Pt 4, 14). Indeed, Socrates, Plato, Aristotle, etc., are teachers, and the ideas they put forward can be possessed independently of their name and person. But Christ is the very truth he teaches, the way he indicates, and the life he promises: "I am the Way, the Truth, and the Life" (Jn 14: 6). In short, it is his name that works salvation: "…whatever you ask in my name, I will do" (Jn 14: 6, 13). 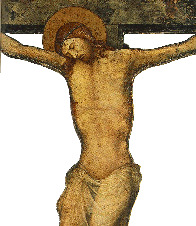 The first sign of the loss of faith in the power of the cross, that is, in the name of the crucified and risen Christ, is a politicization of the gospel, which reduces the good news of salvation to a universal political and social doctrine that presupposes the natural good will of all human persons, and that evil is merely the result of poor education and unenlightened political decision making. Of course, if that were true, who'd need a savior? All we'd need are the right party and higher taxes. But Catholics believe in a savior, which implies a number of things about sin, human limitations, the need for grace, and faith. I recently met with a former student, and during our conversation I was struck by his acute ability to see through the façade of university life, as well as his veritable disgust at the radical indifference to truth, goodness, and justice that he says characterizes the typical university student. My student burns with a love of the good that seems greater than his love of himself. In fact, what burns within him is the flame of supernatural charity, for only something supra-natural can urge him on to what exceeds the limited capacity of his nature, and it is precisely this desire in him that has made him keenly aware of his radical limitations. What he is beginning to realize is that he has no human capacity to accomplish all that the charity within him demands; only God can accomplish the good he envisions, because God has no limits, and so he knows that the only option left is to place himself entirely at God's disposal, to live and act in his name, in the Person of Christ, to be used according to his purpose: "For unless the Lord build the house, in vain do the builders labor" (Ps 127, 1). Hence, the reason the efforts of his fellow students to bring about needed change at the university level have failed; for they act on their own strength and in their own name, not in the name of the Lord who alone holds the keys of death (Rv 1: 18). Such a surrender, though, requires the faith that the Lord, not us, will accomplish, through those who choose to live and suffer in his name, all they desire for others and exceedingly more, without the benefit of seeing and delighting in the fruits of their efforts. It is nothing other than faith in the power of the cross, that is, faith that our life and labor in him, as well as the accompanying darkness and loneliness that will overwhelm us at times, as well as our death, will end in the light of resurrection.